The Maine Legislature and the Baldacci Administration passed the School Reorganization Law in June of 2007. The Law includes eight goals. Commissioner Gendron in her regional meetings in the summer of 2007 directed Mainers to “do their due diligence” in considering whether and how consolidation would attain these goals. C. to increase the “quality” of learning for all children in Maine schools. This Report Card evaluates how well the district consolidation requirements in this law have achieved these three purposes. It asks, “After nearly two years of effort, is consolidation doing what it was intended to do?” The report does not evaluate the entire law’s effectiveness but focuses on the impacts of its major element, the consolidation of school system offices and superintendencies. Each of the three purposes – efficiency, equity, and quality -- is addressed below, with summaries of evidence used to evaluate the effectiveness of the consolidation policy. This policy evaluation uses data provided by the Maine Department of Education, summaries of these data from, among others, Dan Bechard (Ste. Agathe) and Brian Hubbell (Bar Harbor; mdischools.net), and data reported directly by districts and through news articles. Questions about this evaluation may be directed to: Gordon.donaldson@umit.maine.edu. A. EFFICIENCY: What has been achieved and at what costs? I. ACHIEVEMENTS: WHAT CONSOLIDATION HAS OCCURRED? COMMENT: 22 MONTHS OF EFFORT HAVE PRODUCED MINIMAL CONSOLIDATION AND PROJECTED SAVINGS FROM CONSOLIDATION. 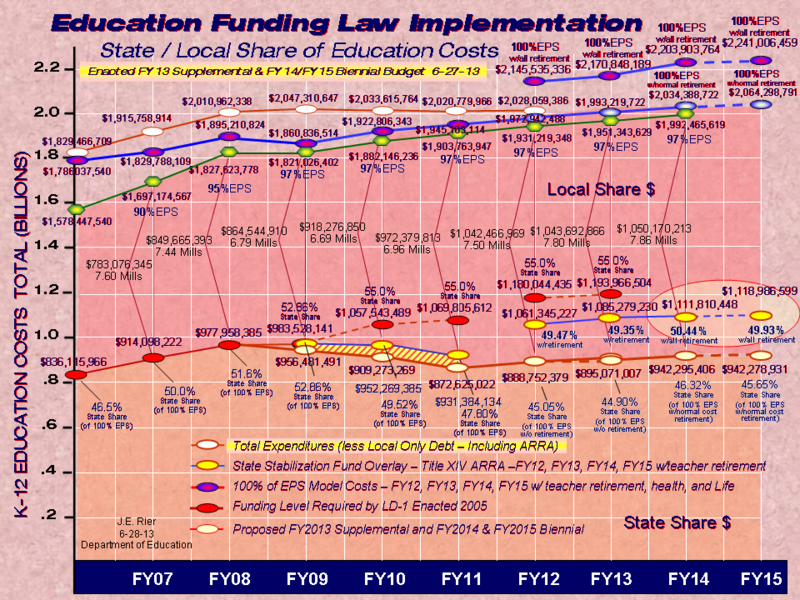 NOTE: Savings have been achieved in 2008-9 from the law’s requirement that districts reduce expenditures on special education, transportation, facilities, and system administration. These requirements are separate from the requirement to consolidate. COMMENT: PLANNING AT THE STATE AND LOCAL LEVELS OVERLOOKED OR DID NOT REPORT MILLIONS OF DOLLARS IN NEW COSTS THAT WILL EXCEED ESTIMATED $1.64 MILLION SAVINGS FROM CONSOLIDATION. d. MOST PENALIZED TOWNS ARE IN THE RURAL TIER: PENALTIES WILL MAKE POORER TOWNS EVEN POORER; THEIR SHARE OF STATE AID WILL GO TO WEALTHIER DISTRICTS. COMMENT: PENALTIES FAILED TO CONVINCE 130 MAINE COMMUNITIES OF THE MERITS OF CONSOLIDATION, LEADING TO $7 MILLION IN REDUCED RESOURCES FOR EDUCATION IN THESE COMMUNITIES. B. EQUITY: Has the consolidation law “leveled the playing field”? 1. MOST PENALIZED TOWNS ARE IN THE RURAL TIER: PENALTIES WILL MAKE POORER TOWNS EVEN POORER; THEIR SHARE OF STATE AID WILL GO TO WEALTHIER DISTRICTS. 2. WEALTHIER TOWNS IN RSU’S AND AOS’S WILL PAY A HEAVIER SHARE OF COSTS THAN WILL LESS WEALTHY TOWNS. For example, Vassalboro will be assessed $250,000 more and Waterville and Winslow together will be assessed $251,000 less to form an AOS together. 3. NO PLANS TO ACHIEVE EDUCATIONAL EQUITY WERE REQUIRED BY MDOE, SO NO EVIDENCE EXISTS TO KNOW WHETHER NEW RSU’S AND AOS’S WILL ENSURE THAT UNDERACHIEVING STUDENTS WILL RECEIVE A BETTER EDUCATION THAN UNDER THE PRESENT SYSTEM. COMMENT: THE CONSOLIDATION LAW HAS INCREASED INEQUITIES AMONG MAINE TAXPAYERS STATEWIDE WHILE ONLY MAKING SMALL IMPROVEMENTS IN TAXPAYER EQUITY WITHIN 17 NEW DISTRICTS. IT HAS NOT ADDRESSED ACHIEVEMENT EQUITY AT ALL. C. QUALITY: Does the consolidation law promise to improve the quality of education for all Maine students? NO PLANS TO IMPROVE THE QUALITY OF LEARNING FOR ALL STUDENTS WERE REQUIRED BY THE MDOE. THE APPROVAL PROCESS FOR RSU’S AND AOS’S WAS NOT BASED ON ANY PLANS FOR EDUCATIONAL PROGRAMMING, TEACHING, ASSESSMENT OR THE LIKE. THEY WERE DEVOID OF EDUCATIONAL PLANS AND INFORMATION. COMMENT: NO EFFORTS HAVE BEEN MADE TO ENSURE THAT NEW SCHOOL DISTRICTS WILL DELIVER HIGHER QUALITY EDUCATION THAN OLD DISTRICTS DID. invested so far in the consolidation process? COMMENT: MAINE HAS EXPENDED OVER $15,000,000 TO CONSOLIDATE. MAINERS HAVE CONTRIBUTED UNTOLD HOURS AND ENERGY TO EXAMINE WHETHER CONSOLIDATION IS A BETTER WAY. 1. FINANCIAL INVESTMENTS AND LOSSES FAR OUTWEIGH ACHIEVEMENTS IN TERMS OF DISTRICTS CONSOLIDATED, SUPERINTENDENT OFFICES CLOSED, AND THE PROJECTED SAVINGS FOR RSU’S AND AOS’S. THE EFFICIENCY GAINS FROM CONSOLIDATION AS IT IS DEFINED IN THIS LAW ARE MINIMAL OR NON-EXISTENT IN MOST REGIONS. THE INVESTMENTS REQUIRED TO ACCOMPLISH CONSOLIDATION MAKE THIS LAW A “BAD BUY” FOR MANY COMMUNITIES. 2. THIS LAW HAS FAILED TO ADDRESS MATTERS OF EDUCATIONAL EQUITY. BASED ON RESEARCH THAT SHOWS THAT EQUITY IS MORE LIKELY IN SMALLER SCHOOLS AND THAT LARGE DISTRICTS TEND TO CONSOLIDATE SMALL SCHOOLS INTO LARGER ONES, EDUCATIONAL EQUITY SEEMS UNLIKELY TO INCREASE IN MAINE. 3. THIS LAW HAS FAILED SUFFICIENTLY TO ADDRESS MATTERS OF TAXPAYER EQUITY. ALTHOUGH NEW RSU’s MAY REDISTRIBUTE SCHOOL COSTS BASED ON TOWN PROPERTY WEALTH, THE LAW APPEARS TO INCREASE TAXPAYER INEQUITIES ON A STATE-WIDE BASIS. THE LAW’S PENALTIES ADD TO THIS INEQUITY. 4. THIS LAW HAS FAILED TO ADDRESS MATTERS OF EDUCATIONAL QUALITY. BASED ON RESEARCH THAT SHOWS THAT LARGER DISTRICTS DO NOT CREATE HIGHER ACHIEVEMENT, IT APPEARS TO WEAKEN QUALITY IN SOME COMMUNITIES. This Report Card on Maine’s 2007 district consolidation law finds the implementation of the law, to date, to fall far short of the law’s purposes and promises. Nearly two years into the consolidation effort, the law’s failure to achieve or promise greater efficiency, equity, and quality warrant immediate and decisive changes to the present course of action if not outright repeal of the law. At a time of severe financial shortfalls, Maine cannot continue to spend so much money and other resources on a policy that is so clearly flawed. Most Mainers have not been directly affected by consolidation because they reside in school districts that were not required to consolidate. Many others deemed consolidation unproductive and voted not to pursue it. 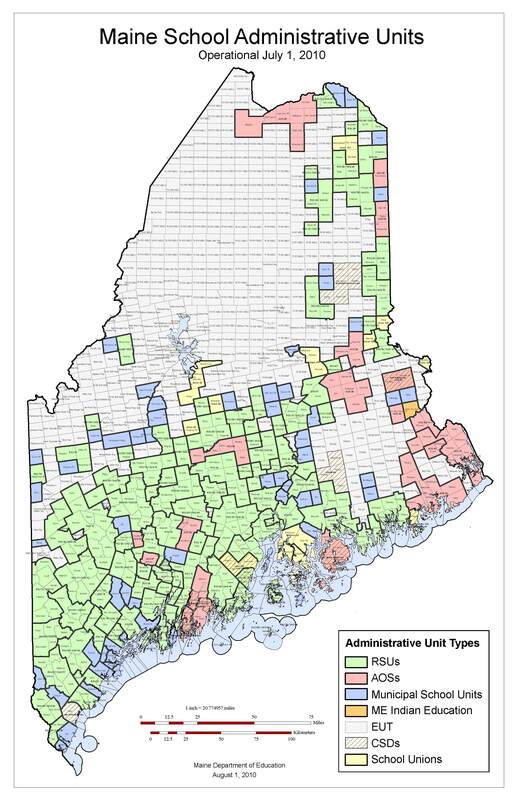 Yet 17 new districts have formed; in the coming years, these districts can help us learn whether Maine’s consolidation policy will deliver more efficiency, equity, and quality. 1. CALL AN IMMEDIATE MORATORIUM ON ENFORCING THE LAW IN COMMUNITIES WHICH HAVE CHOSEN NOT TO REORGANIZE. THE EVIDENCE OF EFFECTIVENESS CANNOT JUSTIFY ENFORCEMENT, FURTHER EXPENDITURES OF TIME AND MONEY, OR PENALTIES FOR NON-COMPLIANCE. 2. ESTABLISH A RIGOROUS, INDEPENDENT, AND TRANSPARENT EVALUATION EFFORT TO DEMONSTRATE WHETHER THE 17 REORGANIZING DISTRICTS WILL REALIZE EFFICIENCIES AND IMPROVEMENT IN EQUITY AND QUALITY OVER THE NEXT TWO YEARS. 3. ESTABLISH PROCEDURES AND SUPPORTS FOR COMMUNITIES SERVING OUR MOST NEEDY STUDENTS TO ASSIST THEM IN REACHING HIGH QUALITY, EQUITABLE, AND EFFICIENT SCHOOLING. ENCOURAGE EXPLORATION OF ALL STRATEGIES TO ATTAIN THESE GOALS, NOT MERELY CONSOLIDATION OF DISTRICT OFFICES.